Plati is a pretty, little village among the oldest on Limnos, and is just a few km away from Myrina. The population swells during the summer as it is a popular tourist destination, and has plenty of amenities, facilities and other services to accommodate the high seasonal demand. Stroll through the paved, central square and enjoy a coffee while taking in the view of the magnificent village church. For a refreshing swim, try: Plati Beach as it has crystal-clear, blue waters; Evgati Beach has a one-km long shoreline; Thanos Beach is the most popular with its aqua-green waters and hidden in a rock is the captivating chapel Panagia Kakaviotissas, and Stivi is the most secluded and peaceful one, and can be found near the church Ag. 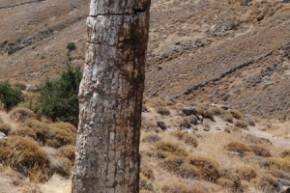 Paraskevi on Cape Tigani. Varos is a picturesque village of few households and fine, quaint stone houses. You owe it to yourself to navigate through the narrow, cobblestone streets and admire the traditional architecture of its buildings. Therma has a lush-green landscape, snuggled next to the chapel Prophet Ilias, known for its therapeutic and healing mineral springs. The village is also known as Thermal Springs Hephaestus. The temperature of the water that gushes out cracks in the rock can reach as high as 41 degrees C! 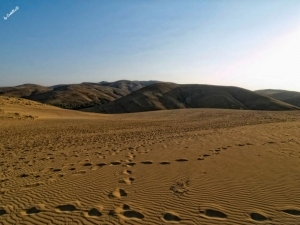 According to tradition, the Limnian earthen clay mined here has healing and therapeutic properties in it. Even though the vast majority of the island’s population is concentrated in Myrina, we suggest you visit at least these other 4 areas of the island, where majestic landscapes, natural beauty and monuments of ancient civilizations loom around every corner and await you at every turn! Six km outside of Myrina is the village Kaspakas, founded in the Byzantine era by sea captain Kaspakas, and has a mere 950 residents. The homes were built on a hillside and the topography is very mountainous and at a high altitude. While in the village, you would be amiss without paying a visit to the Mirsini farmhouse. The family maintains a cottage industry of homemade pastas, pastries, sweets and other farm-fresh goodies. Try their products and taste the purity of the natural, local ingredients….especially the almonds and figs. Two km from Kaspakas is the beach and church of Ag. Yanni; enjoy a swim at the beach, and then check out the little, quaint church, proudly perched atop a rocky hill overlooking the sea. From the village harbor, a short walk will take you to the beautiful Katsaitis waterfalls and aon old watermill. Myrina, the island’s capital city and busiest port and center of commerce, is nestled along the west coast of Limnos, between Tourkikos Gialos and Romeikos Gialos, and is home to over 6,000 citizens. The island is named after King Thoanta’s wife. Thoanta was the first settler here, back in either the 12th or 13th century A.D. The city’s name was Kastro (castle) until 1955, when it was officially changed to Myrina. Myrina is built on the ruins of an ancient city and current archeological site, and if you look out into the shallow water (in the city) you can see the presence of ancient ruins lying on the seafloor. The city’s trademark is the medieval castle that has proudly stood high above, for centuries and centuries. The panoramic view from atop is all encompassing and unique, giving you an impression as if the entire Aegean were washing ashore here on this city. The castle of Myrina dates back to 1207 and was built by the then-ruling Venetians. The Platonia deer (species particular to Limnos) have adopted the castle as their home and shelter, and tourists and visitors alike can easily view them wandering about. Leisurely meander your way through the myriad of cobblestone roads of the city, and experience the Old World Europe feel of the open-air, central market, which can be quite vibrant during the summer months, and where modern meets tradition at every corner. In Tourkikos Gialo (the old Turkish quarter), you’ll find a picturesque harbor with fisherman tending to their nets, boats and small tavernas. North of Myrina's castle is the Romeiko Gialo (old Roman quarter) lined with buildings and homes of the neoclassical-style architecture, including the famous “Mansions of Egypt”. These houses were the first Greek settlement in opposition to the Ottoman Turk occupation. It is on this side of town where you’ll find the archeological museum, with exhibits featuring artifacts dating back to the prehistoric age (when Limnos was first inhabited) to the Byzantine era. Another nearby museum worth checking out is the Ecclesiastical Museum, located in the Metropolitan Building. In 1993, an archeological discovery was made near the grounds of the hotel “Porto Palace”, located in Avlona. The ruins are of a temple dedicated to Artemidos. Romeikos Gialos and Tourkikos Gialos are the best spots for swimming and a day at the beach, while for a night out, your best bet is to hit one of the bars, cafes and tavernas along the Myrina harbor, under the illuminated castle. ….this makes quite a spectacle! Kontopouli is the 4th largest community on the island where you’ll find old, impressive buildings and churches that still operate today. In this village, the exile Yannis Ritsos wrote his famous “Kapnismeno Tsoukali”. Exploring this village during your vacation in Limnos is well worth your effort and time. In addition to the building architecture, other “must-see” spots are the churches Ag. Dimitriou (built in 1872) and Ag. Anastasia. The latter has a beautiful, green garden and an underground, holy water fountain. Also, the renovated Dimitriades School (built in 1925) and the stone water fountain (1927). The local square is filled with shops, cafes and tavernas where you can try delicious, island-authentic dishes. Don’t forget to hit the gorgeous beaches and other sight-seeing destinations (see below). Other important places to visit while in Kontopouli are the archaeological sites Hephastia and Kaviriou, found just outside town. There lies the legendary cave of Philochtedes. Experience Mother Nature up close and personal, through the 3 protected wetlands (Limni Aliki, Asprolimni and Chortarolimni), which you can find by going east. Bird watching is the favorite wetlands activity among tourists and visitors. For great swimming and an overall great beach outing, visit beaches Neftina, Zemata and especially Keros, which stretches for some 5 km, features spectacular sand dunes and whose gusts make for favorable windsurfing and other water sports. 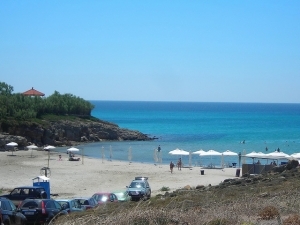 Keros Beach is located near the village of Kalliope. Two other beautiful sandy beaches, located along the northeast coast, are Panagia and Plaka. 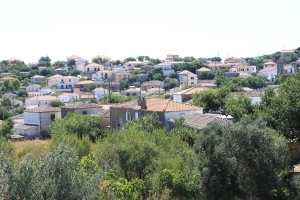 Romanou village is home to a mere 500 people and is named after Romanos the Melodist. The Egyptian-style mansions that decorate the main streets were built back in the 19th century. In Romanou you’ll enjoy seeing the many traditional windmills, stone-built schoolhouses and other notable buildings. You can also visit the church Gennisios of Christou, built around 1830, complete with original iconography and the ruins of the ancient city of Ag. Germain (Komi). To take a breather and cool off, find the rock of gushing spring water, located at the eastern entrance to the village. Kaminia is a tiny village southwest of Moudros, with just 300 residents. However a large percentage of the buildings and homes here are in the traditional, Limnian architectural style. You’d be amiss without stopping to see the ancient settlement Poliochni, which is just a couple km from the village square. Other places to check out while in Kaminia include the Holy Temple Kimisis of Theotokou, the Sokastro castle and its tombs carved right out of the rock and the town, cobblestone square. This is a great point to steal a few quiet moments, enjoying a coffee under the shade of the trees. The Gulf of Moudros is home to the largest, naturally-protected harbor in the Mediterranean Sea. For this important reason, Moudros played a leading role in the history of the area, and became the island’s first capital. The port was used as a naval base by the Greek military as a launching point to liberate islands all around the Aegean. It was also utilized by the Anglo-French troops during World War I’s Gallipoli campaign in 1915, and even hosted the signing of the peace treaty that ended the Great War between the Allied forces and Ottoman Turkey. Moudros was later again used during the Second World War, this time by the Germans. Today, the Gulf of Moudros is decorated by the countless colorful fishing and sailing boats docked in her harbor. The harbor is an ideal spot to pass the day, doing some shopping, enjoying your coffee and getting a bite to eat. The options for cafes, bars, tavernas, restaurants and shops lining the waterfront are endless here. It is worth your time and effort to visit the majestic shrine Evangelismo of Theotoko (constructed in 1903) as well as the historic temple Pammegiston Taxiarchon. In addition to the churches, here you will find the famous and respected Cemetery of the Allied Forces, where you will see the memorial stones of the lost men and women in uniform from the Gallipoli campaign of WWI. There are stones here representing Great Britain, France, Greece as well as other allied nations. In the city of Moudros you can also see the stunning aspects of volcanic and geologic formations, including the rare petrified forest, via an exhibit in the Old City Hall. Take a refreshing dip in the sandy beaches of Fanaraki and Chavouli, both will impress you with their geologic landscape and both are situated close to Moudros. A little bit further out you’ll stumble into other smaller, yet just as captivating and peaceful beaches, such as Parthenomito. Established in 1926, Nea koutali village was founded by refugees from the Marmara Peninsula region, during the population exchanges (Turkey and Greece) of the 1920s. Residents of Nea Koutali were renowned divers, as you would learn by visiting the Maritime and Sponge Museum. Here you can discover the secrets of sponge diving and the many uses of the sponge. Experience the magical scene of the harbor, strewn with traditional fishing boats, while overlooking the bay of Moudro.